Human trafficking is subject to complicated legal definitions, but the essence of this crime is straightforward: a person who is trapped in a situation of economic exploitation from which they cannot escape is very likely a victim of trafficking. Someone involved in moving that person into exploitation, or keeping them there against their will, is very likely a trafficker. The forms it takes are as varied as the potential for profit. Women, men and children are trapped on farms, fishing boats and construction sites; in factories, mines, restaurant kitchens and private households. They are coerced into fighting wars, giving up their organs, marrying into servitude, or acting as commercial surrogates. Long banished to the outer edges of the human rights agenda, trafficking (or “modern slavery” as advocates prefer) has emerged as a major issue of concern. Each of the past four US presidents, right up to the incumbent, has loudly proclaimed his personal commitment to ending this scourge – as have religious leaders, celebrities and some of the world’s wealthiest individuals. In a radical shift of the legal landscape, the overwhelming majority of countries have, over the past decade, criminalised trafficking. Funding for programmes aimed at fighting trafficking has never been more abundant. At the international level, the issue has been taken up by the UN General Assembly and Security Council. The Sustainable Development Goals commit states to “take immediate and effective measures to eradicate forced labour, end modern slavery and human trafficking”. But progress against human exploitation has been painfully slow, despite the vast investment of political capital, resources and expertise. In trying to work out what has gone wrong – and what we could be doing differently – it is useful to critically examine some of the basic assumptions on which the anti-trafficking movement is built. The hunger for hard data – especially around the number of victims and the profits being generated – is intense and increasing. That is understandable. In our metrics-obsessed world, Bill Gates’ assertion, ”If you can’t measure it, it doesn’t exist”, rings unsettlingly true. Without being able to paint a clear picture of the size of the trafficking problem, it is difficult to attract attention, to solicit money, to show how well we are doing. Few public figures speaking on this issue have resisted the temptation to cite trafficking statistics that are at best unverifiable and at worst demonstrably false. The anti-trafficking community as a whole has been unconscionably silent about the shoddy research methodologies that regularly produce the wildly varying numbers on which it so heavily relies. Trying to improve our understanding of what is happening, where and to whom is a worthwhile endeavour. And there are some isolated pockets of progress, for example around the International Labour Organization’s attempts to measure the prevalence of forced labour. But the simple, unspoken truth is that we just don’t know how many people have been or are being exploited – or the amount of money that such exploitation is generating. The usual complications of measuring hidden populations and hidden economies are compounded, in this case, by the sheer breadth of the phenomenon and the lack of universally accepted diagnostic criteria and credible tools of measurement. Presenting our data as better than it really is smacks of hubris and overreach. It also risks validating interventions that can only pretend to be evidence-based. Our best option is to scrap these expensive and time-consuming attempts to come up with new and better figures. Rather we should be investing in forensic-level investigation of specific sectors that produces hard information that is then used to shape and evaluate interventions – such as has been done in relation to the Thai shrimp industry, Uzbek cotton production and Malaysia’s electronics manufacturing sector. Trafficking and related forms of exploitation might be social and economic problems, but they are also crimes. It makes sense that international and national frameworks to address trafficking prioritize prosecution and punishment. Unfortunately, the results on this front have been miserable. Even those who don’t trust the data would feel confident estimating the number of victims of trafficking in the millions. But last year, just over 9,000 convictions worldwide were reported. More than 90% of these cases related to sexual exploitation – a reflection and reinforcement of the tenacious and dangerous myth that this is the most prevalent form of trafficking. The consequences of not doing enough to prosecute exploiters are stark and shameful: virtual impunity for offenders and an unconscionable lack of justice for victims. But pushing for more convictions is not without its complications. An effective criminal justice response to trafficking requires good laws, honest, highly skilled officials and strong institutions. As the numbers show, even the most advanced criminal justice systems experience great difficulty securing convictions for these complex offences. Pressuring underdeveloped, often corrupt states to improve their dismal prosecution rates (as is official US policy) contributes directly to serious miscarriages of justice. This is not progress; it is a charade. We need to get the criminal justice part of the response right. Prosecution should work, but at present it doesn’t, anywhere. States and the international community must be prepared to admit this and commit to finding out what is going so terribly wrong. My experience of over 20 years on the criminal justice front line suggests that over-complicated laws, a lack of alternative offences, under-incentivised leadership, and toleration of violence and exploitation against certain groups including migrants, women and the poor all go a considerable way to explaining why we are doing so badly and what we might need to think about changing. After several decades of slow and often frustrating attempts to address exploitation through more conventional means, the attention of the anti-trafficking movement is now fixated on supply chains. No trafficking event, no study or report, indeed no law is considered to be serious and complete unless it addresses this newly fashionable “solution” to the problem of human exploitation. The idea is straightforward enough: it is now well established that much of what we wear, eat, drive and text with is tainted with forced and exploited labour. By encouraging or compelling corporations to open up their supply chains to external scrutiny, we are forcing them to take responsibility – while also giving consumers the information they need to make more ethical choices. The recent exposure of slave labour in the Thai seafood sector for example, led to pressure being placed on multinationals such as Costco and Walmart to clean up their supply chain. It also forced the Thai government to take steps to protect the impoverished and vulnerable migrant workforce that is the backbone of this valuable national industry. But the significant limitations in this approach are ignored by the growing army of supply chain disciples. First, however much we would wish otherwise, the structure of the global economy makes it impossible to secure transparency and accountability in deep supply chains where much exploitation takes place. It’s one thing to find out where our fish come from, but quite another to track the fragmented and geographically dispersed suppliers of minerals and other raw materials that are used in our car batteries and mobile phones. Second, most, if not all, of the informal service economy – including the highly vulnerable domestic service sector as well as forced marriage – will continue to be out of reach. Third, even the most rigorous attention to supply chains can only end up benefiting workers in export industries, leaving untouched those whose exploitation produces goods and services for domestic consumption. Addressing supply chains must be part of any comprehensive attack on exploitation, but it is no silver bullet. In fact, there is a real risk that the current obsession will deflect precious time, energy and resources away from the grindingly difficult, less glamorous tasks we know very well are critical to making a difference. These include: identifying and supporting victims; securing more and better prosecutions; reducing vulnerabilities of migrants and migrant workers; enforcing labour legislation; and addressing the structures and attitudes that help to normalize exploitation. In 2015, the Pope, a Zen Buddhist master, Sunni and Shiite clerics, the Archbishop of Canterbury and a South American rabbi came together to pledge to eradicate slavery by 2020. Many others, including the US Senate, have made similarly ambitious commitments. We can applaud such ambition and optimism, while worrying about the fundamental misunderstandings they unconsciously reveal. Human exploitation is not an aberration – rather, it has built our world and continues to power economic growth to the point that global wealth and productivity would be under threat if exploitation were suddenly removed. This is the real stumbling block, the one that helps explain a few stark and unsettling anomalies: why we ignore the role that labour migration, weighted heavily in favour of developed economies and big business, plays in fuelling vulnerability; why governments are so willing to pass strong laws and so unwilling to implement them effectively; why supply chain transparency is on the table but not deep corporate complicity in exploitation – and the government corruption that makes this possible; why the “decent work” agenda is so passively but effectively resisted. A solution to trafficking is indeed within our grasp. But it will require much more of us, not least a commitment to being in this for the long haul – and a willingness to question even the most comforting of our assumptions. 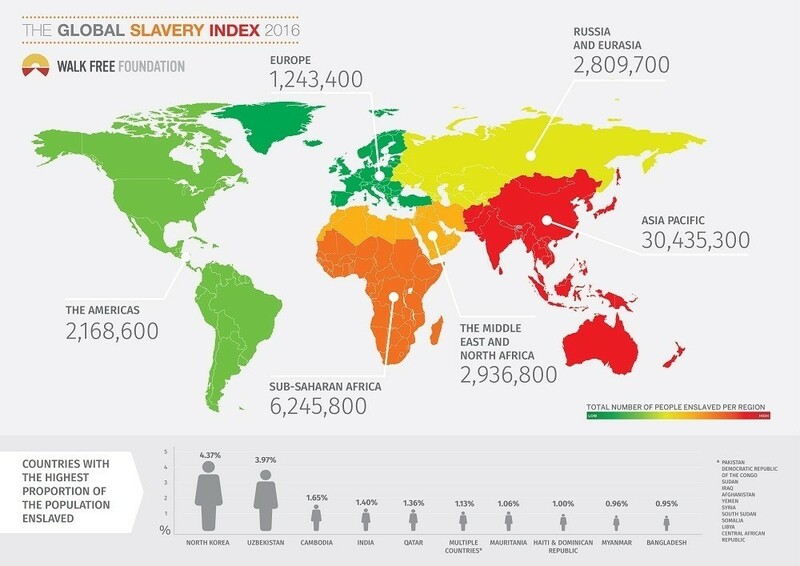 How many people are enslaved in the world today?